Lauren Dane has posted a snippet from her novel, Chaos Burning, which was just released. There are always more fabulous covers popping up. To see them all, head over to facebook, where I’ve added them to the June album for your viewing pleasure. Have you read The Hunger Games? Are you looking for something similar to sink your teeth into? If so, Two Busy Brunettes have come up with a whole list of novels you should check out then. Although I would take some of the titles on the larger list with a grain of salt. They include Anne Bishop’s Black Jewels series, and while it is a fabulous series, I wouldn’t say it’s anything like The Hunger Games. Tez Says has found five new deals in the publishing world, including a film option for Mira Grant’s Newsflesh trilogy. Stumbling Over Chaos has posted another fabulous edition of Misadventures in Stock Photography and can we really ever get enough of Slave Boy? Plus lots of signed novels by JR Ward, Sherrilyn Kenyon, Liz Maverick, Stacey Jay, Cassie Alexander, Christine Cody, Chris Marie Green, Karina Cooper, Amanda Bonilla, Jenn Bennett, Kristen Painter, Carolyn Crane, and many many more. Have you seen Parajunkee View’s Blogging 101 series? If not, you really need to check it out. I’m always learning new things whenever I catch one and for anyone just starting out, they are a very valuable resource. Rachel has posted the latest one and this time she’s talking about Spicing Up Your Blog Content. For having a review site, I’m not a huge review reader (I don’t want to be influenced), so while I have a ton of blogs in my reader (so I can do these posts), I’ve been kind of getting bored with it (not with the news posts, my reader itself). You can only read so many guest author visits and contests posts before you want something more entertaining to read. 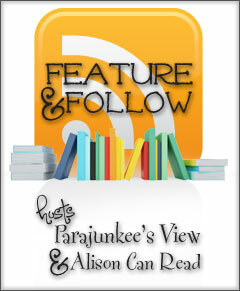 So I’m joining Parajunkee’s latest Feature & Follow and checking out some of the new blogs that have posted up recently. I’ve already found two blogs I’m unfamiliar with – the co-host Alison Can Read and this weeks feature blogger Candace’s Book Blog. Suvudu is giving away an ARC of Terry Brooks’ Wards of Faerie – ends July 9th. GoodReads is giving away 10 copies of Carrie Vaughn’s Kitty Goes to War – ends July 3rd. All Things Urban Fantasy is giving away a copy of Vicki Pettersson’s The Taken – ends June 20th.